When I was in Atlanta I bought 8 lbs of organic quinoa for $20. That’s about half the price of what I’ve paid for it before at Whole Foods. I try to get some whenever I’m down in that area (closest store is in Cincy) and whenever I can squeeze it into the budget. Love that different flavor and textures of quinoa. Love that it’s gluten free. And love that it’s so good for you! Saute the onions, mushrooms and garlic. But don’t add in the celery, unless you want it to be cooked. If you want it to be soft, this is the time to add it. 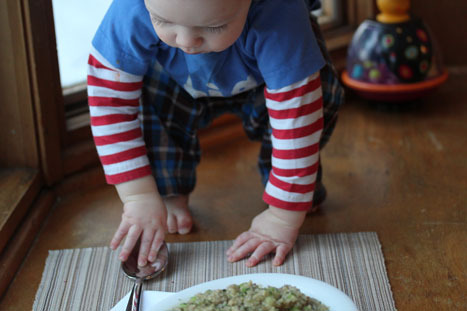 I like to have a little crunch in my pilaf, so I add the celery after the quinoa has cooked. Add the liquid and quinoa. Bring to a boil, the cover and simmer for 20 minutes. 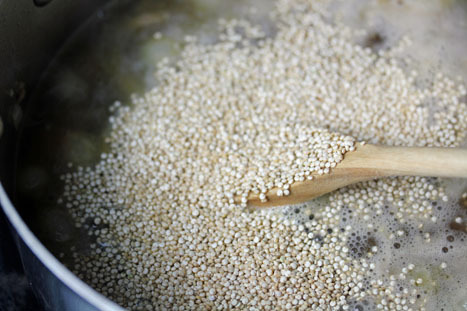 The quinoa will be cooked when you see that it has swelled some, and the little white ring around the grain will start to separate. Look at my cute little visitor. Monkey, is more like it. He can get himself onto our end table next to the couch by pulling himself up onto our Dominican rocking chair, then onto the arm of the chair and finally up onto the end table. I have a skylight in my kitchen and if I can get in there early enough in the day to cook and use the natural light from the skylight for the photographs, I can get much better photographs. But some days I can’t get into the kitchen early enough…and it gets too dark in there for good pictures around 4 pm. So my back up is the bay window that is part of our office/playroom. And guess who can climb up into the bay window. And he decided to come pay a visit and run a little quality control on my quinoa. Please pardon the eyelashes.It’s unjust. I give you the Mushroom Quinoa Pilaf. That, by the way, passed the 14 month old taste test! 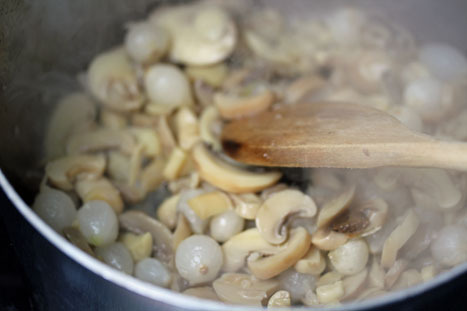 In a large skillet, add a touch of olive oil, then add the pearled onions (no need to thaw), crushed garlic and sliced mushrooms. Saute for a few minutes, or until the onions become translucent. Then add the broth, water and quinoa. Season with some salt and pepper. 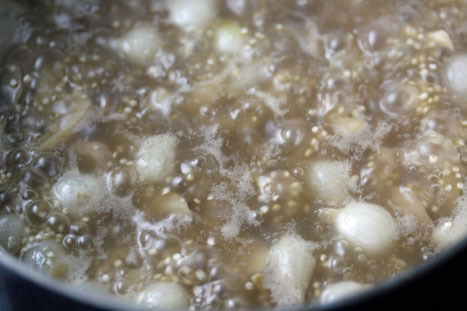 Bring to a boil, then cover and reduce the heat and let simmer over medium low heat for 20 minutes. Chop the celery and then add to the pilaf just as it is finished cooking. Remove from heat. Sprinkle with a little parsley before serving. We had this with baked chicken and peas! 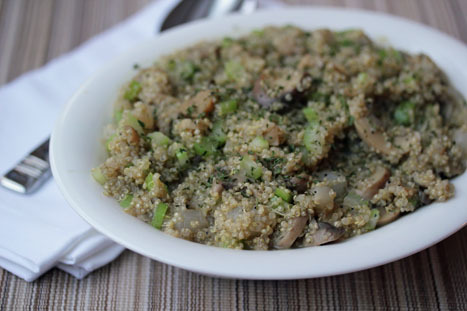 Serve Mushroom Quinoa Pilaf with Chicken and Peas. Nice to see some organic foods used on your site! My daughter is anaphylactic allergic to sulfites, and although this recipe has some natural sulfites (mushrooms, onion, garlic) I can play with it to make it friendly for her to eat. Not only the eyelashes, but the baby hands. I love little baby hands! blog (well, almost…HaHa!) Wonderful job.